We compare these email marketing behemoths and make a recommendation. Both Constant Contact and iContact have both had redesigns completed relatively recently. It seemed like the perfect time to compare the two to see the strengths and weaknesses of both email marketing platforms. I’ve broken down each platform into 6 distinct categories. My goal is to help you see which one is best for your specific situation. Skip to the end if you’d like a quick summary. Cost is a common concern, so let’s try to compare the two platforms. iContact has two main plan levels: the Email Marketing Plan and the Pro Automation Plan. The “basic” plan still has a lot of features that would be considered advanced (based on other email marketing tools), like built-in A/B testing. On the other hand, Constant Contact also has two main plans: the Email Plan and the Email Plus Plan. However, the basic plan is really basic; it basically lets you send email blasts and nothing more. To get autoresponders you need to upgrade to the Email Plus Plan. For the majority of cases, autoresponders are a necessity, so I’ll compare iContact’s Email Marketing Plan to Constant Contact’s Email Plus Plan, since they have a similar set of features. At low levels of subscribers, iContact is much cheaper, but the difference narrows as you go up in list size. With Constant Contact, you can send unlimited emails to your subscribers. With iContact, you can only send up to 6 times your subscriber limit per month. So if you have 5,000 subscribers, you can only send 30,000 emails before you have to upgrade your plan (or pay an overage fee). If you send a high volume of emails per month, Constant Contact will often end up being cheaper. One thing that you will see throughout this review is that iContact isn’t the prettiest interface compared to Constant Contact, but it’s relatively simple and easy-to-use. From there you can upload a variety of file formats (.csv, .txt, .xls) that you might have from exporting contacts from a previous email marketing tool. You can do the same on Constant Contact, but you also have a few other options. Most notably, you can import contacts that you have on other applications like Gmail, Outlook, or a variety of CRMs. If this is relevant to your situation, it’s a factor you should consider. Creating emails in Constant Contact consists of a simple workflow. It’s a similar process on iContact. The big difference is that the templates are focused on layout, not design. In other words, iContact’s templates are rather plain and will require more time to customize them to look nice. Other than that, the editor functions just as smoothly. Both platforms will give you the basics you need, but not much more. The appearance doesn’t really matter unless you copy and paste the data for a report or presentation. If you are a developer or have a developer who will be creating custom signup forms on your website, either platform will work fine. Both Constant Contact and iContact have solid APIs and documentation. But what if you’d rather make a form using either of these tools and embed it on your website? In that case, both are again pretty similar. Constant Contact lets you choose the text, fields to show, and the overall color scheme. The forms are simple, but fairly attractive. Overall, both tools offer similar simplicity and flexibility, so go with the one you personally think looks best. A common trend in email marketing is to target North American business users. This is why both of these tools really only offer support during North American business hours. Constant Contact support is available from 8am – 10pm ET, Monday to Thursday, and just to 9pm on Friday. iContact offers support from 8am – 8pm ET, Monday to Friday. If support is a big deal to you, I’d suggest looking at some of our other email marketing platform reviews. Pricing iContact is cheaper usually, but limits you to sending 6 times your subscriber count emails per month. Importing Subscribers Both allow you to import from file. Constant Contact also lets you import from CRM applications. 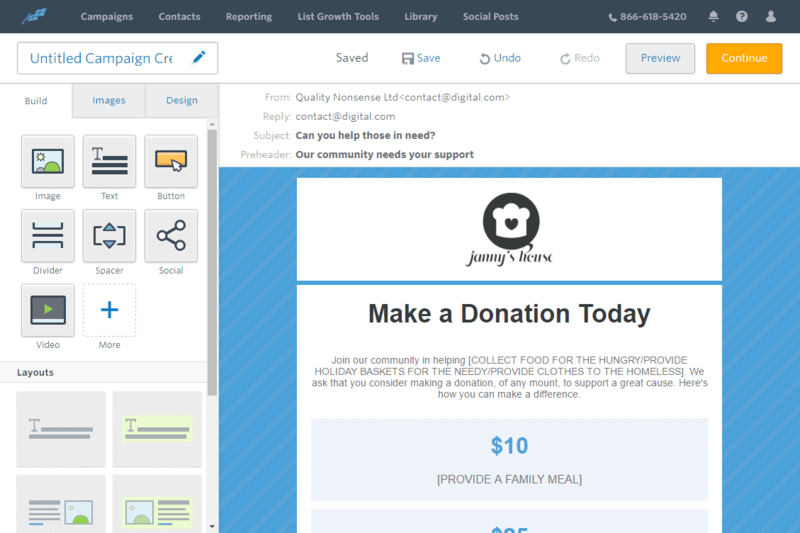 Creating Emails Both offer templates that you can customize, but Constant Contact has a wider variety of templates that require less modification. Reporting Both offer the essentials. Adding New Subscribers Both let you create basic forms. iContact gives you slightly more styling flexibility. Support Both only have support during North American business hours. You want more control over the appearance of your signup forms. Try iContact Now. 30-Day Free Trial. You want to minimize the time you spend customizing the layout of emails. Try Constant Contact Now. 30-Day Free Trial. Overall, this is a case where they’re both similar platforms, so there won’t be too big of a difference for you in most situations. You are here: Home > Email Platforms: The Best Ones Ranked and Rated for 2019 > Constant Contact vs iContact – Which One is Right For You? Previous: Mailgen Review: Unlimited Emails But What About Templates? We Find Out.